His name is Viraj Puri; when he was 13 years old he has created a teen blog for bully prevention. 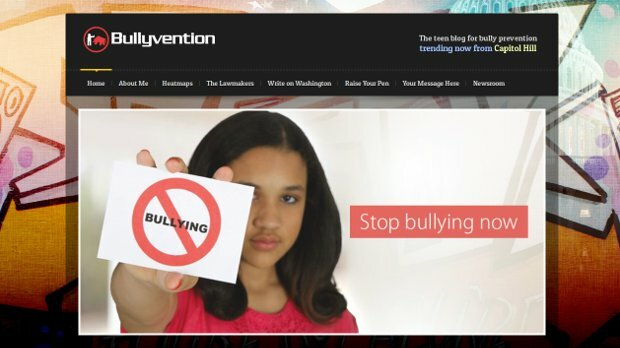 A little later, Bullyvention was the first site to team up with the U.S. House of Representatives’ Congressional Anti-Bullying Caucus. You can learn a lot about bullying on his Bully Facts page and from the Caucus; but the main point of his initiative is to use technology to bring lawmakers and teens together. Because bullying is such a widespread problem in USA schools, his blog trends from Capitol Hill. From Capitol Hill, he interviewed Members of Congress who have a story to share or advice to give to victims of bullying. He also believes it is important for Members of Congress to hear from teens. On his Write on Washington page, you can find the name of your Senators and Representatives and write them to say how you feel and what you expect lawmakers to do about bullying. Who is really the insecure one?